For checking in a few seconds 6 and 12V batteries in stock or on the vehicle. 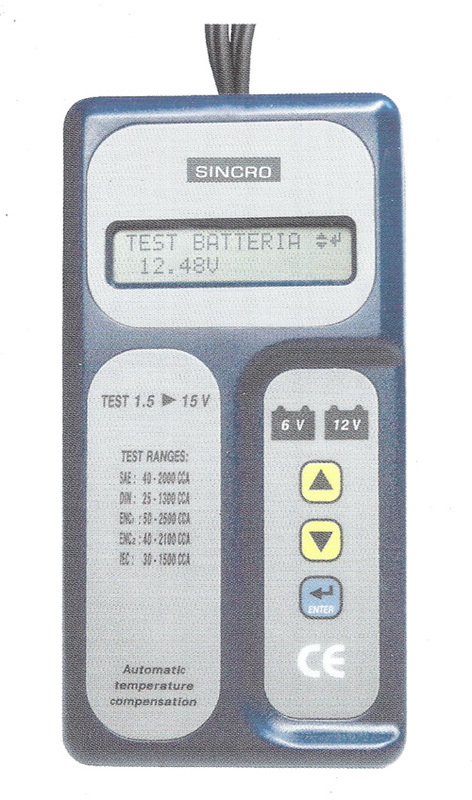 Displays voltage with 2 decimals, current delivery CCA (Cold Cranking Amps) according to SAE, DIN, IEC, ENc1, ENc2 standards (chosen by the operator) and the messages: good & pass - good & recharge - recharge & retest - bad & replace - bad cell. Voltage measurements also on completely discharged batteries, with automatic temperature compensation, with no need of charging them. No heat, no sparks, no damages to ECU. Voltage measurements from 1 to 30 V for checks of alternator, diodes and regulator at different speeds. Diagnosis of starter motor's efficiency through measurements of battery voltage drop. Displays useful step by step operating and diagnostic messages.